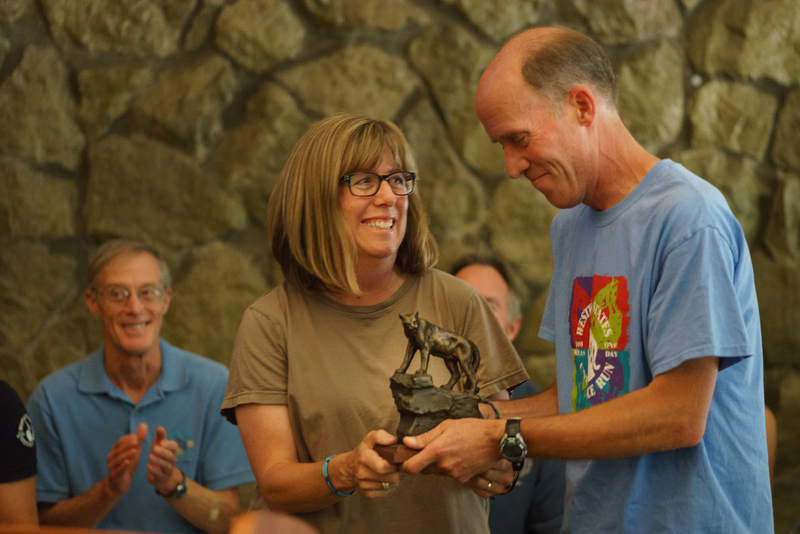 The Little Cougar is awarded to individuals who have served the Western States Endurance Run organization through the years in extraordinarily significant ways. 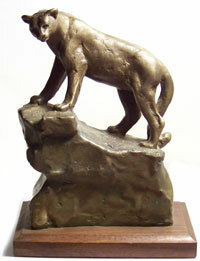 Cast in solid bronze, the Little Cougar weighs in at 6½ pounds. This award recognizes exceptional lengthy service to the Western States Endurance Run. Over the decades we have awarded thousands of buckles, and more than a hundred “Friends of the Trail,” but only 24 times before today the Little Cougar. When John Trent succeeded to the presidency of Western States after Tim Twietmeyer, he must have felt as humbled as Jefferson. And yet, just as Jefferson went on to achievements at least as great as Franklin’s, so has John Trent produced over the years an unmatched assembly of contributions to our Run. In his professional career, JT has served as journalist, professor of journalism, consultant to a Nevada Senator and Governor, and now assistant to the president of University of Nevada Reno. Before he became our president, we have appropriately come to recognize John as the Roger Angell of our sport. Through exemplary diplomacy brought Western States on our terms into the Ultra Trail World Tour. Last year paced his daughter Katie to her 29:56 finish. JT, at the risk of alliteration, today the Western States Endurance Run thanks you for leadership marked by empathy, effectiveness, excellence, and elegance. All Little Cougar Awardees are (in alphabetic order): Gordy Ainsleigh, Mark Falcone, Charles Gabri, Phil Gardner, Richard Goodwin, Stan Jensen, Doug Latimer, Bob Lind, M.D., Mo Livermore, John Medinger, Wayne Miles, Antonio “Tony” Rossmann, Charles Savage, Diana, Desiree and LeGrand Scott, Greg Soderlund, Curt Sproul, Larry Suddjian, Gary Towle, M.D., John Trent, Tim Twietmeyer, Betty Veal, R.N., Shannon Weil, Tom Winter and Royce Zumalt.